Most of us know, Marie, exactly what you are discussing, and our sad hearts are with you, yet. That's a hard one. Our dogs are sleeping in our garden. I wanted them nearby. Ok the whole truth. the first one is sleeping in our former garden. There was no way to bring him with us when we moved, but i still thing of him as "here". The Don is always with you - in the closet or in your heart. He will be with you, whatever you do with his mortal remains. I had a beautiful small urn hand-thrown for my Black Kitty, Hooter--I like to think she'd be pleased to continue to be admired. I miss Estorbo, too; I chuckled thinking of his "caddle". You don't know me, Marie, but I've been reading your blog for many years now. My husband and I had to put our first cat, Coco, to sleep in 2009, when we were living in Virginia. She was young...just a few months shy of 6 years. Anyway, we've since moved to New Jersey and Washington State...and we are the proud staff to 2 orange kitties...and we still have Coco's ashes. To me, it makes no sense to part with them. 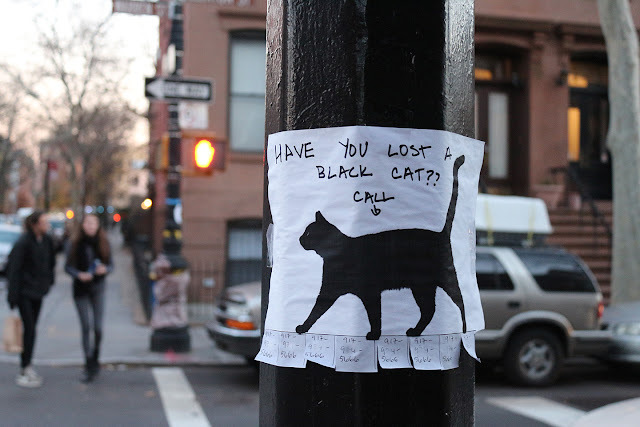 Please call that number, it might not be a hoax and a black kitty is genuinely trying to find his/her owner. Yes, we do want to keep the furry members of our families with us. My companion, Cinnamon, a boxer, is winding down her time with me. I am having a hard time with the idea she will no longer be with me and waiting for me to be there with her. I have planned her permanent place in an out of the way space in my garden. The garden is where I "am". And it will be where she waits for me, in the reverie of weed pulling, the smell of the fresh green grass, the beauty of the lilacs in late spring, and tart crisp bite of the Honeycrisp apples she would share with me in the fall.. I vote for scattering the ashes on your old rooftop. When my cat Oscar died, I told them I did not want the clay paw print but then called right back and said I did. I am glad I have it although it is kind of creepy that the imprint was taken after he died. Carry the paw print with you and put in the base of a plant Estorbo particularly liked. XXOO. I doubt that cat dust would be the worst thing anyone has inhaled in this city but if feline cremains are like human cremains, they're more crumbles than dust -- which makes me lean toward the Viking funeral in the channel. Probably also not the worst thing to end up in the channel . . . When Dubby died, our vet returned his ashes to us in an urn, which I never really knew what to do with. When we lost Kali, they returned her ashes to us in a simple but lovely wooden box with a space for a photo on the front. One day when I was at work, Mike opened the box, and put Dubby's ashes in with his sister's. My favorite photo of the two of them, which I didn't know at the time would be one of the last I ever took of them together, is in the frame. I think either of your ideas sound lovely.